The juice has top notes of green watery elements of Provence melon, paired with golden kiwi and hints of red current; a heart of pumpkin flower combined with a soft floral nuance that includes the wetness of linden blossom and the softness of golden pollen, and a drydown of creamy milk notes paired with raspberry, honey, sisal, essence of lily and tulip wood. About the only thing that sounds good to me is the essence of lily and tulip wood. True Star wasn't bad, but it wasn't good, either. Smelled like a thousand other fragrances already out there. These people are churning out the the sequels, aren't they? Beyonce, Britney, JLo. I guess they are selling. what i want to know is, who actually buys these scents? i assume children, and/or the very unsophisticated?! I only tried True Star very recently. I assume it sold like hotcakes but I don't actually know. It did nothing for me at all. I just bought this on Friday. The only reason I purchased it was to add to my collection and the fact my husband said he liked it. One day, I had a sample of it in my purse, and I sprayed it on in a rush! To my surprise, the sales clerk told me that she hasn't sold very much of it at all! Who knows? 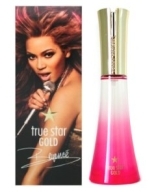 It has certainly not made any stir on the fragrance forums, but I have no idea if it has sold well or not. At any rate, hope you will enjoy your bottle! got out my 6 year old sample and bleh. going in the “gifting” basket, but I doubt I will even give it away.